When the bottle has a flavor stated like “Ginger” before root beer, I get kind of wary of what my review is going to entail. Anchor Ginger Root Beer was a happy surprise! It has a mild flavor that isn’t too gingery. There is a light almost cherry scent and the flavor is somewhat fruity as well. Anchor Ginger Root Beer is very dark, and is light on head, with the foam dissipating quickly. It is a very filling brew in that I loved the flavor, but could hardly finish the whole 12 oz. bottle. This root beer has substance! Handy Father gives Anchor Ginger Root Beer a score of 4.25 out of 5 for its excellent flavor. 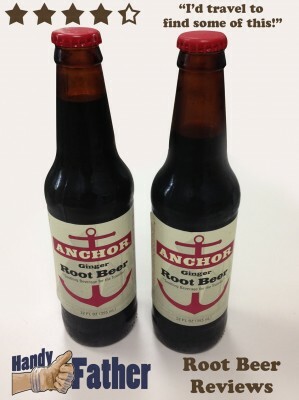 Anchor Ginger Root Beer is bottled by & under the authority of Orca Beverage Soda Works in Mukilteo, WA. Ingredients: Carbonated Water, Cane Sugar, Natural and Artificial Flavors, Caramel Color, Phosphoric Acid, Citric Acid, Sodium Benzoate (A Preservative), Ginger. If you’re at all a fan of root beer, Handy Father strongly suggests that you immediately procure a couple bottles of Anchor Ginger Root Beer ! I know I have one more bottle of this delicious root beer. It stands on its own. Maybe after lunch I’ll have a bit of liquid dessert in the form of an Anchor Ginger Root Beer! I can’t wait!